Tree cover loss is not the same as deforestation. “Tree cover” can refer to trees in plantations as well as natural forests, and “tree cover loss” is the removal of tree canopy due to human or natural causes, including fire. Methodology changes starting in 2011 may lead to inconsistencies between the 2001-2010 data and the 2011-2017 data. Read more here . 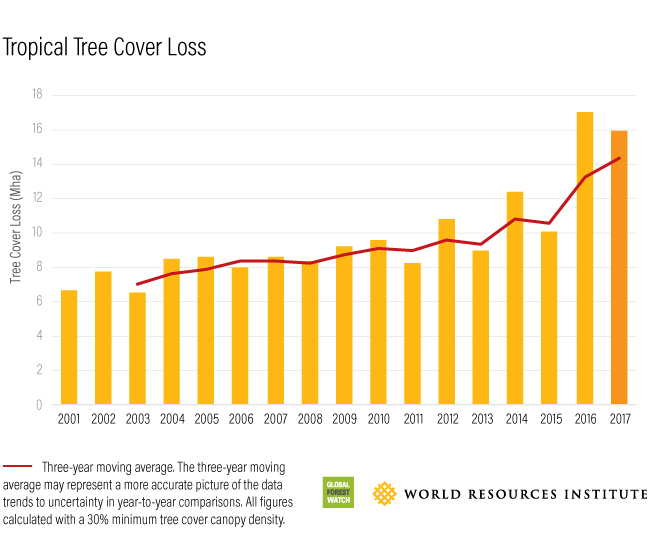 Despite concerted efforts to reduce tropical deforestation , tree cover loss has been rising steadily in the tropics over the past 17 years. Natural disasters like fires and tropical storms are playing an increasing role, especially as climate change makes them more frequent  and severe . But clearing of forests for agriculture and other uses continues to drive large-scale deforestation. The rapid increase in tree cover loss happened as peace came to the country. Last year, the Revolutionary Armed Forces of Colombia (FARC), the country’s largest rebel group, was pushed out of large amounts of remote forest  they previously controlled. 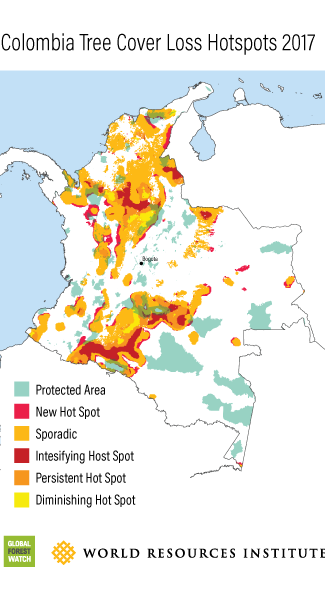 The FARC kept tight control  over land use and allowed little commercial use of resources – with the demobilization, a power vacuum has emerged, leading to illegal clearing for pasture and coca, mining and logging  by other armed groups . Land speculation is rampant , as people occupy and deforest new areas in the hopes of getting a land title under the forthcoming rural reform  law, a key component of the Peace Agreement. Abandoned FARC trails  are also providing access to previously remote forest areas, with some regional governments officially expanding these roads to promote development. The Colombian government is actively working to slow forest destruction and, in fact, was recently ordered by the Supreme Court  to get deforestation in the Amazon under control. The government has already cancelled  a major highway project connecting Venezuela and Ecuador, destroyed  several illegal roads, expanded Chiribiquete National Park by 1.5 million hectares, and launched the “Green Belt” initiative  to protect and restore a 9.2-million-hectare forest corridor. It’s too early to tell if these actions and others will be enough to slow the country’s rampant forest loss. The rise comes despite declining deforestation rates , and is mainly due to fires  in the Amazon. The Amazon region had more fires in 2017  than any year since recording began in 1999, causing 31 percent of the region’s tree cover loss according to University of Maryland data, which for the first time attributed specific instances of tree cover loss to fires. Though forests are likely to recover since fires mainly cause degradation rather than deforestation (read more here ), the blazes have counteracted  Brazil’s decline in deforestation-related carbon emissions since the early 2000s. 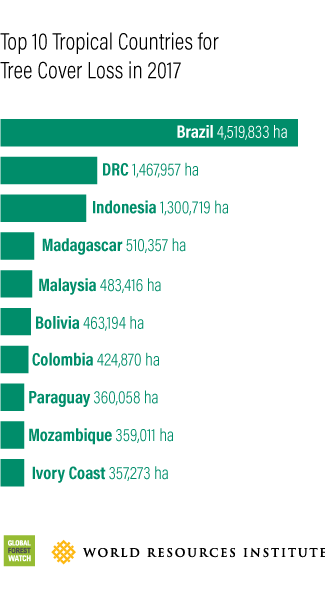 While the southern Amazon did face a drought in 2017, almost all fires in the region were set by  people  to clear land for pasture or agriculture. Lack of enforcement  on prohibitions of fires and deforestation, political and economic uncertainty , and the current administration’s roll-back of environmental protections  are likely contributors to the high amount of fires and related tree cover loss. Experts are also concerned  that high levels of fires and forest degradation are becoming the new normal in the Amazon. Climate change combined with human-caused deforestation  is increasing the prevalence of drought, making the landscape more vulnerable  to fires. 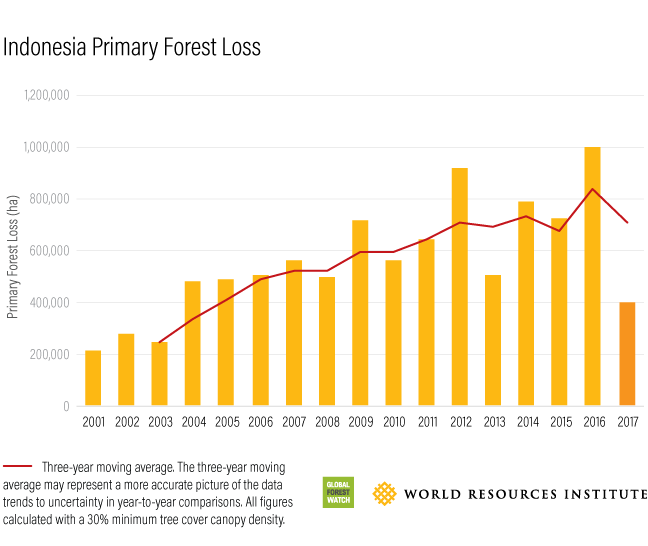 Unlike most tropical forests, Indonesia experienced a drop in tree cover loss in 2017, including a 60 percent decline in primary forest loss . While some provinces in Sumatra still saw increased primary forest loss—including 7,500 hectares (18,500 acres) in the Kerinci Seblat National Park— provinces in Kalimantan and Papua experienced a reduction. The decrease is likely due in part to the national peat drainage moratorium , in effect since 2016. 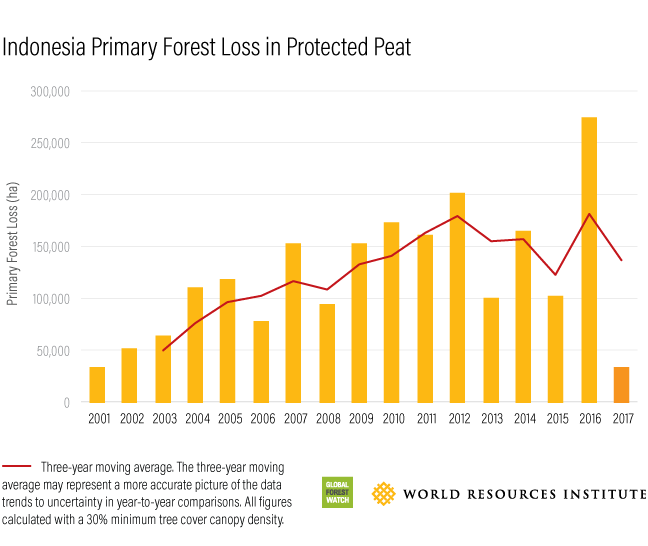 Primary forest loss in protected peat areas went down by 88 percent between 2016 and 2017, reaching the lowest level ever recorded. Additionally, 2017 was a non-El Niño year, which brought wetter conditions and fewer fires compared to past years. Educational campaigns  and increased enforcement  of forest laws from local police have also helped prevent land-clearing by fire. Tree cover loss in the Democratic Republic of Congo (DRC) reached a record high in 2017, increasing 6 percent from 2016. Agriculture, artisanal logging and charcoal production drove the tree cover loss, with nearly 70 percent of it occurring in agricultural areas known as the rural complex . While shifting cultivation does not necessarily indicate expansion into primary forest, growing populations can intensify agricultural practices, thus reducing fallow periods where trees regrow naturally. 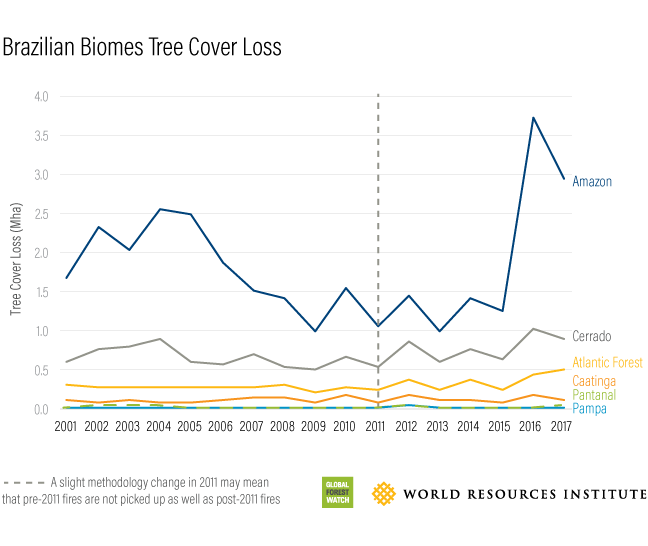 Our analysis also showed that in 2017, 3 percent of overall tree cover loss occurred in protected areas and 10 percent within logging concessions. For the past 16 years, DRC has had a moratorium on new industrial logging concessions, but the government reinstated concessions  to two companies in 2018. Environmentalists worry  that opening the forest to additional logging could exacerbate the country’s growing deforestation problem. 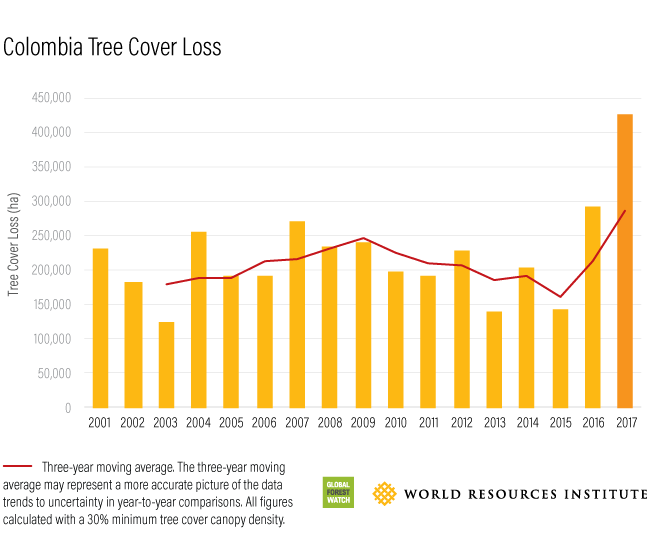 But there is more to DRC’s tree cover loss than industrial logging concessions. While the moratorium applied only to industrial logging, artisanal logging, often illegal, also soared. Given the increasing trends observed in 2016 and 2017, it is critical that DRC move ahead with improved land use planning and forest law enforcement while enforcing better management practices. The extreme hurricane season of 2017 that killed thousands  and caused billions of dollars  of destruction in the Caribbean also had adverse impacts on the region’s forests. The island of Dominica lost 32 percent of its tree cover in 2017, while Puerto Rico lost 10 percent, including significant losses in El Yunque National Forest . While tropical forests in cyclone zones are naturally resilient to storms , scientists worry  about their ability to recover in the face of more powerful storms due to climate change. Leaders are meeting today at the Oslo Tropical Forest Forum  to reflect on progress to date and discuss plans for the future. Given the dire news from 2017, it’s clear that anti-deforestation efforts are more important than ever.